I'm dashing through the snow sunshine with a quick post today. I'm off to an office lunch in honor of my retirement where I'll be roasted in high style until everyone hurts from laughing. After 45 years in the legal field, which I loved, I'm now off to the stamping fields, which I'll love even more! I've made a card today for the Merry Monday Christmas challenge which is to use a snowman or snowpeople on your card. I used snippets on my card so I'm happy to be able to join the Shannon Ann Igans over at Pixie's Snippets Playground! 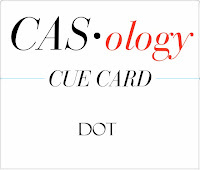 I missed the challenge last week at one of my favorites, so I'm happy to be able to play this week with the current CASology challenge, where the cue card word is "DOT." It turns out that the challenge this week at Christmas Card Challenges is to use polka dots and I did, so I'm playing with them, too. Since I used a Penny Black sediment that is from a brand new set, I'm joining in again at the January Penny Black Saturday Challenge, which is "new." And, lastly, the always popular "Anything Goes" challenge is up over at Simon Says Monday Challenge! Please join in the fun and click on the challenge links for all the details about rules, sponsors, and prizes! My NBUS today is the sediment which comes from the Penny Black set "Joy to the World." and from my papers. The plaid paper is from a PTI pad called "Funky Town" and the dotted papers are from a Bo Bunny pad called "Soft Shades Double Dot." The snow globe stamp and the separate snow man stamp are both unmarked, probably made so long ago that they didn't have machines to apply the tiny text detail. You know, in 1530 or around there, back when I was a girl. The snowglobe doesn't come with snow for some strange reason, so I had to apply the wittle flakes by hand. Yesterday, as soon as I finished my post thanking you for following me and celebrating my benchmark 400 number, I went to the kitchen and made cinnamon rolls. Well, goodness, it must have been the aroma of cinnamon in the air because the next thing I knew, the doorbell rang and there were EIGHT new friends ready to join the party!! I haven't stopped grinning since! Please help me welcome them! Traci Rancier of Depleting my Stash. Traci has been blogging since 2012 and has a wonderful rich and CAS style of craftswomanship that I know you will enjoy! Vanessa Menhorn of Wings of a Butterfly. Vanessa has also been blogging sine 2012. She has a huge following and has been published many times for her exceptional works of art! Cassie Trask of A Day in the Life of a Homeschooling Mom. Cassie is a military wife and mother who has been blogging and sharing her fabulous card art since 2008. Like so many moms, crafting provides much-need "me" time for mom which makes the whole family happy! Jennifer of Jen's Scrappy Pages. Jen is also a SAHM and as the name of her blog implies, she is an avid scrapper as well as a card artist. She has also been blogging since 2008, which means ... you know what it means! Tons of wonderful inspiration awaits you! Sharla of This Thing Called Life. Sharla is an award-winner who has been blogging since, what? 2008! (I somehow feel there was something happening in 2008 that everyone knew about but me, LOL!) Sharla has a fun blog and makes darling cards! Melissa Cochran of Crazy Paper Freak. Melissa is a hoot and a wonderful card artist who started blogging last year. I knew I was going to love her when I saw her profile note that she had two rotten kids! Donna Nuce of Crafty Colonel. As you may have figured out from the name, Donna was career military and a mom and on top of all that, she's crafty! She's wonderfully crafty and has been writing her entertaining blog since 2012. Diane Sims of Inky Fingers in Indiana. Diane just started blogging the end of last summer, but there is a huge array of wonderful card art on display for your inspiration. Unfortunately, Diane is only a Google+ blogger, so I can't return the flavor and join her site, nor can I leave comments because I'm intentionally not a Google+ person. I can still visit you, Diane, but I feel badly that you won't know when I do. Thank you so, so much, ladies, for rapidly jump-starting me into reaching my next benchmark! It's a delight to have you join my friends at the Playhouse! Well I hope your colleagues treated you like Royalty at your retirement do! They will miss you terribly. Love your card today, those papers are beautiful and I love the snow you created in the globe. Just had to come back to say - Can't believe I was No. 1 today - woohoo! Love those double dot papers & this is just darling, Darnell! Glad someone else from 1530 is still around with unmarked stamps--LOL! Happy, happy retirement--enjoy the celebration! Hopefully I'll soon be joining those ranks! Darnell, I love your little snowman complete with hand-penned flakes, and what better way to celebrate your retirement (WOOHOO!!!) than with a double-header challenge card from the Merry Monday and Paper Players gals! I love the papers you used and I did catch your tiny little bit of Crushed Curry! Glad you played along with both challenges this week with this happy little fellow! Such a fabulous card Darnell, I love the image and gorgeous colours. I hope you had a wonderful lunch with your colleagues, I am sure they are going to miss you. Congrats on all your new followers, it seems everyone else enjoys visiting your blog as much as I do. Love the way you've offset the dp. As well as the colours! Great Christmas card! Your snow globe and snowman are so cute. I just love snowmen. Love the cute snowman with his crushed curry brush! Hope you had a fabulous send-off, and now you can look forward to uninterrupted playtime in the playhouse! Remember when Dean Martin hosted those roasts? I can see you doing the roasting, rather than being roasted. You come up with such funny things to say. 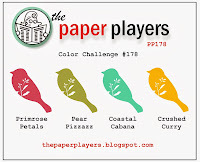 I can't believe you found paper that had just the right colors for the challenge. The snowman is so cute in his little globe. Congratulations on your retirement. Thank you for the upbeat, funny and sometimes profound postings! You will wonder how you ever had time to go to a full time job!! Congrats on your retirement! Cute snowman! What a super cute card Darnell. And it's so awesome that you are able to retire and will be able to spend more time stamping! Great card Darnell! I love the bold patterns you've chosen for your paper panels and your great use of white space. Thanks for joining us for this week's Simon Says Stamp Monday Challenge! Well he's a cute little fella surrounded by the most perfect of flakes I've yet to see!!! Congrats on your retirement, hope they roasted you till you were well done!!! Congratulations on your retirement, Darnell!!! Love your adorable snowman card. Thank you for joining us at Merry Monday!!! "...probably made so long ago that they didn't have machines to apply the tiny text detail." LOL!! And I think that I have the same stamp!! You really did make me LOL. I do adore your sweet card. The paper pieced scarf is darling. Congratulations on your retirement! I've been retired since 2008 and have loved every minute of it. Thank you for your shout out about my blog. This snowman card is adorable. Love the DP you used. Have a great day. Love your little snowman--very cool plaid scarf too! It matches your artfully arranged papers perfectly. Hope you had a fabulous lunch. Congrats on your retirement!! Who is this Shannon Annigans person u speak of...I may know her hahaha!! HUGE congrats to you on your retirement!!! YES I am officially dedicating the card I posted today to YOU! What an amazing feeling it must be knowing that you can now be employed full time at the Playhouse!! Hope you enjoyed your retirement party!!! Your coworkers and friends are going to miss you terribly! I only wish I could know what an absolute treat and hoot it would be to work with you!!! I feel like I've missed out...big time!!! Congrats again, Darnell!!! And of course the card rocks!!! Mwah!!! Congrats on your retirement! Think of all the crafty fun you'll have! Congratulations on 400+ followers!! That is huge Darnell, but I'm not surprised that anyone who stumbles in here wants to stay and play :) Happy retirement & looking forward to see many more wonderful creations! Great card Darnell-and you combined ALL those challenges! Hi sweet lady!!! Huge congrats on your retirement !!!! You are a super star @ work & in crafting --- I'm a sure of that!! Ok, your card is suuuuuper cute & fun!! It's good that you added your own snowflakes -- so you could decide if it was a little dusting of snow... Or a mega blizzard ...!! Lol ! Hope your party/roast was super fun!! I'm sure it was memorable --! Gosh I love the colours you have used on your card Darnell, including the bit of Crushed Curry. The snowman snow globe is just perfect. The hand drawn snow flakes really complete it. I love that your stamps MIGHT have been made in 1530!! Chuckled and chuckled. I am closing in on 60, with a birthday in a few days. I have announced these pesky yearly reminders are hereby cancelled!! Congratulations on your retirement. :-) Thank you so much for joining us at Merry Monday. What a FUN card Darnell! The snow man is so AWESOME!!! I'm loving the fun colors on this cute snow globe, and I love the tilted panels - which always send me screaming for the hills for some reason! LOL Congrats on your retirement sweet friend - it's meant to be enjoyed, so I hope you'll do that!! Who hoo party time....whew you amaze me with all the challenges you find. And wahoo, big celebrations on congratulations on your retirement - they are sure to miss you! And well done on 400 followers, your blog is such fun that am sure you'll be up to 500 in the blink of an eye. Congratulations all around ! Retiring you look far too young !!!! Hope it was a wild wild party !!! 4oo posts !!!!!! and all that while working and super congrats on your cinnamon rolls they must be pretty good to entice 15 new followers or is it just that you are a wonderful and generous lady who just happens to be one of the nicest, funniest and most generous bloggers in our midst. Whatever the reason we love you Darnell. Huge congrats on your retirement, Darnell. I'm sure you will be missed there, but now you have more time for us! LOL! Your card is perfection, yet again! And until I read that you added the snow, I thought for sure it was part of the stamp! WTG you! Love your cute card with that adorable snowman! Great patterned paper he's paired with too. And now your card....awesome sauce (I think that is the first time I have used that phrase!). I love the angled DP and LOVE the colors and patterns. Sweet job coloring the snow globe and snowperson! I LOVE THE PLAID PAPER!!! How utterly sweet, Darnell!! I love how you arranged those lovely layers beneath the super cute snowglobe. Too fun! Fabulous card, Darnell, and hats off to you for hitting so many challenges. Always fun to get so many and a fab card, too. Thank you so much for playing along at CASology this week. Happy Retirement! I bet you'll be busier now than when you were working! Fabulous card! You must be the master of combining card challenges! So glad you joined us at CASology this week! As for your card hunni...Its gorgeous with that adorable little snowman globe and beautiful papers you have used!! I so enjoy your blog and slices of life you share! You wouldn't even have to show a card, but it's icing on the cake! Nice snow globe and perfectly executed wittle snowflakes! Happy Retirement Party. Rock and Roll! Great CAS card! Love the coloring hoping that you get to do lots of crafting in retirement. Congrats! Darnell I love your design, your patterned paper and the cute snowman!! Thank you so much for joining us at CASology this week! So cute...great colours for that card. Sad about the googleplus people...they miss out on so many comments! Good heavens, you have a following like no other...and it's no surprise, since your blog is the most fun place on the net!!! CONGRATS to you on your retirement, Darnell! I wish I could have been a fly on the wall for your roast...Oh...Em...Gee!!! I'll bet they 'got you' really good, and you had everyone rolling with laughter! I wish you the best of health and happiness...I know you're gonna find LOTS of fun things to do now that you don't have to get up early and be somewhere...enjoy it, girl, you deserve it! I love your darling snowman card! Such pretty pattern papers and the color combo is perfect! Thanks so much for sharing it with us, and for sharing and giving so much of yourself!!! This card is BEYOND ADORABLE!! Love the funky layout & the bright colours! Wishing you a HAPPY RETIREMENT full of extra playtime in the Playhouse! This sure looks like a winner to me! Love your snowman card! Wow, I can't believe you fit all of those challenges in one card! Now that's a new fulltime job! Good luck with your retirement, enjoy! Love the card! Thanks for playing Merry Monday this week! Happy Retirement Darnell :). This is a fabulous card, I love the papers and the cute snowman. Wowee, congratulations on your retirement and your 400 followers! You go, girlfriend! Love your snowglobe card. The image is adorable and the papers worked perfectly for the challenge. So happy you joined us this week at The Paper Players! I love that plaid paper and I always was a sucker for snowglobes! Love that snowman's hat! Fabulous card, Darnell! I love how you've combined challenges with those stunning colors at Paper Players and created this gorgeous snowglobe card. Thanks so much for joining us at Merry Monday. Hugs. Enjoy your Retardment as The doc likes to call it! Welcome to the world of endless coffee which keeps us retardies going. Hugs Mrs A.
Oh my goodness Darnell, this is a just too cute!! What a fabulous way to use up those snippets, I really love that look and will have to give it a try. I also love the clean and simple look, always grabs my eye! Wow...what a sweet card! I love your adorable little snowman standing inside his sweet little round home, just too cute! Congrats again on your retirement, wishing you lots of stamping days and nights and another 400 followers too! What a cute card and the mish mash papers is perfect. I received your Christmas card in the mail and I have to say I just love it. It looks better in real life and I thought it looked pretty good on the blog! So happy you were with us for the last month and happy that you're continuing to play. Hugs to you my sweet friend. Congratulations on your retirement! I love how you used the colors, I struggled with them so much I missed the deadline! You rock for all of the challenges you entered on this fantastic card! Love the way you layered the papers here, Darnell. And aren't those Bo Bunny dot papers scrumptious? Nice job adding the snow - it looks like part of the stamp!